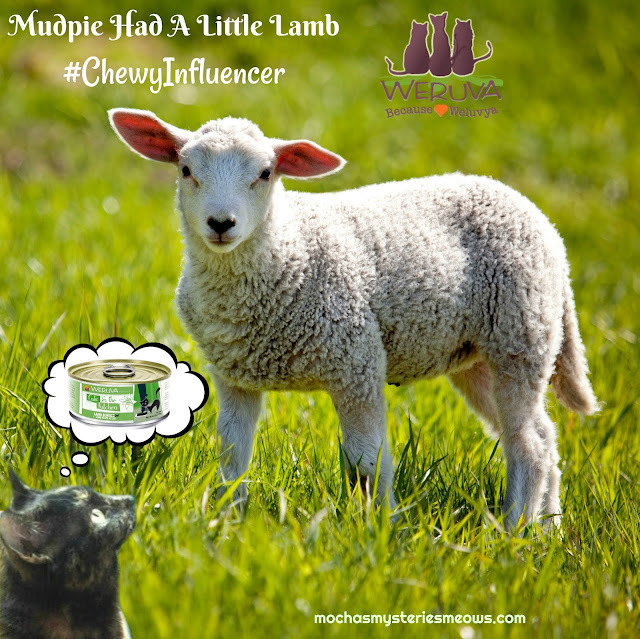 This month I got to try out a couple different things as a Chewy Influencer. First up is the Weruva Cats in the Kitchen Variety Pack. I know you're probably thinking, "But Mudpie, you HATE wet food!" You know me too well, but Weruva is actually a brand I enjoy, especially the pouches that have loads of gravy in them! 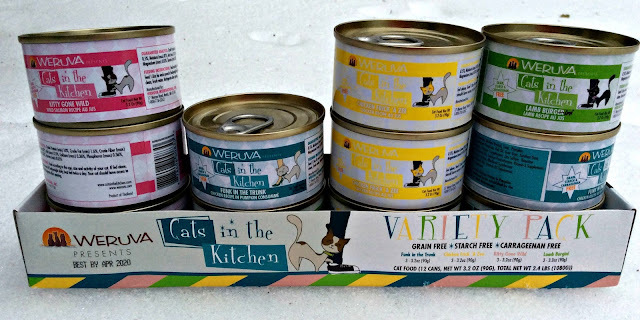 Weruva is known as "people food for pets" because they use only the best ingredients that are high in protein and low in carbs with no grains, gluten, potatoes, GMO ingredients, MSG or carrageenan, making it great for cats with allergies. Variety packs are great for us fussy felines because they allow us to try new flavors we might otherwise miss out on. This one contains 3 cans each of 4 different recipes: Funk in the Trunk (chicken in pumpkin consomme), Kitty Gone Wild (wild salmon au jus), Lamb Burger-ini (lamb au jus), and Chicken Frick 'a Zee (chicken au jus). Aren't those fun names??? The flavor I was most excited to try was the Lamb Burger-ini. 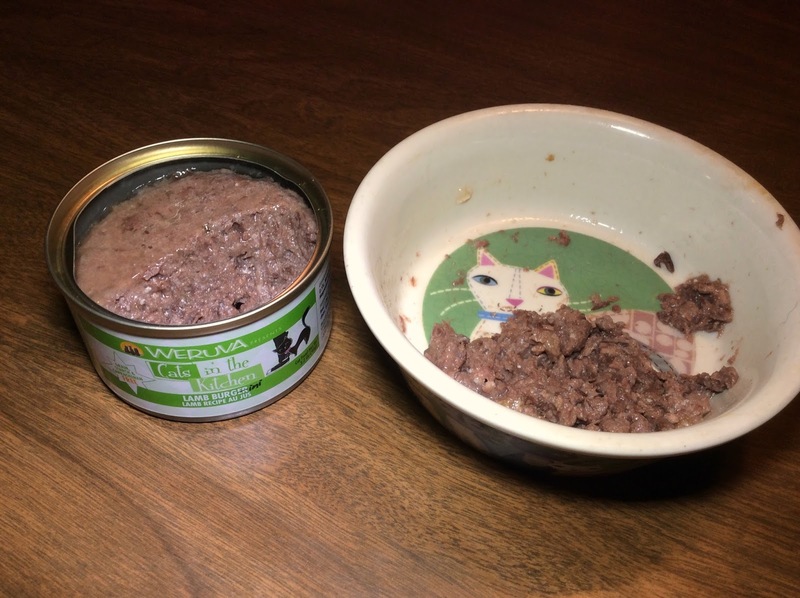 Lamb is one of my favorite proteins when it comes to dry food and treats, but it's pretty hard to find in wet food. Last year I reviewed the new Weruva B.F.F. OMG! (that stands for Best Feline Friend, Oh My Gravy) pouches and I loved the Lamb & Tuna flavor so much that Mommy ended up ordering a whole case of it! The au jus cans in this variety pack aren't as "juicy" as the pouches, but Mommy just mashes it up with some water to make it more gravy-like for me. I was served half a can of Lamb Burger-ini and I approached my bowl like I usually do - with great trepidation. I started picking at it while still standing up in preparation of sticking my nose up at it and walking away. Then slowly but surely I started squatting in front of the bowl. Maybe I planned to stick around for awhile! Mommy was watching me from the living room and she refused to let anyone walk through the kitchen while I was eating. (Wait!!! Mudpie's eating her wet food!!!) I nibbled for a good 5 minutes, and by the time I finished more than half of the serving was gone! I then proceeded to wash my face for awhile looking very satisfied with myself. Even more shocking, later that day when Mommy was cooking dinner I started crying at the shelf for more...and I ate it again!!! If you've been following my eating adventures here on the blog you know what a big deal this is! I'll probably never be an exclusively wet food-fed kitty, but every time we find something that I will eat, even if I don't clean my bowl (which I never do), is a win in Mommy's book! The Weruva Cats in the Kitchen Variety Pack is currently on sale for $13.92. Chewy offers FREE 1-2 day shipping for orders over $49, and with over 500 brands in stock they have something sure to make every cat or dog happy. Tell them Mudpie sent you! Which fun flavor do you think will be your favorite? That is quite an endorsement, Mudpie! Glad ya liked it! We got da variety pack too and have been enjoying it (but we're wet-food only kitties and have been our whole lives). That is amazing, Mudpie! This must be some pretty tasty food. Wow, if you liked it Mudpie, it must be good! Delish! I bet I know some other kitties that would love to try all of those flavors. You and the kitties here are so very much alike, Mudpie. They are very picky with their food, but they sure do love this Weruva just like you do! Happy snacking, Mudpie! Mudpie, no one's appetite remains static...things change, times change, foods change...glad you enjoyed yourself!